Hey there. I'm working on finishing a project I should have started and finished a long time ago. Today I have for you the title page to the album. It's not the first page I've done, and far from the last.I love baseball and am having so much fun using all the baseball themed stuff I've been hoarding away for this project. This page was inspired by Scrap Our Stash Cat in the Hat and Paper Issues Take 5 challenges. My colors for the album are red. white and blue, so the red and white of the Hat were easy for me to incorporate. I even used a striped tag. 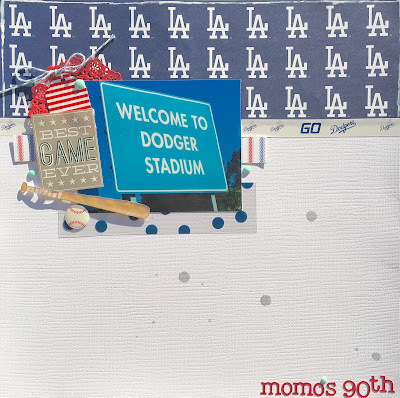 I added some white paint to the edge of the LA paper as a border, then splattered a little silver across the card stock. I also liked how on the book cover treble and white were split, and designed my page with the same idea. Paper Issues new Take 5 challenges asked to use 5 of the listed items in your project. I used blue, card stock, alpha stickers, die cuts, paint/mist, a circle, and twine. Thanks for following me along my creative view. Stop by again soon, I've got lots to share. What a fun page. Awesome clean and simple design. Thanks for your entry in our challenge at Scrap Our Stash! Fits the SOS challenge perfectly! Good for you getting your love of baseball documented. Great title page. Thanks for playing along with us!! This came out so cute!! I also love the new look to your blog. Thanks for joining us at Scrap Our Stash! I love this page, its so simple but yet so creative!! Love the baseball theme and papers/washi. Great job on the interpretation of the SOS challenge!!!! I really love the clean look of this layout and awesome take on the book cover challenge. Well done. Thank you for joining us at Scrap Our Stash. How cool is this layout. Thanks for joining us at SOS.